When I read this novel, I wonder how stunning the 70s must have been in a way. From today’s perspective these times seem so wild and the stars back then had so much more personality and flair (in a good or bad way). A.F. Henley manages to bring back a feeling of how it must have been then in the bright light on the stage and in the shadows behind it. And somehow, being born in the late eighties, I was missing something amazing and I feel a little cheated by life because of that. Schminke Horadam watercolours and Polychromos colour pencils on 300 g Arches watercolour paper. Haruo (on the right) is the main human Character of the Netflix trilogy Godzilla: Planet of the Monsters. He is friends with Metphies an alien. From the minute these two appeared together on the screen, I could not help the feeling that there is much more between them than ”just being friends”. Schmincke Horadam watercolours on Arches watercolour paper 300 g. The original size of this painting is 55 cm x 59 cm. Meet Cole, the boy diagnosed with Asperger’s syndrome from my buddy’s A.F. Henley gorgeous story “Sonata”. This story is as captivating as it is heartbreaking and A.F. Henley handled Cole’s case with so much instinctive feeling and dignity! 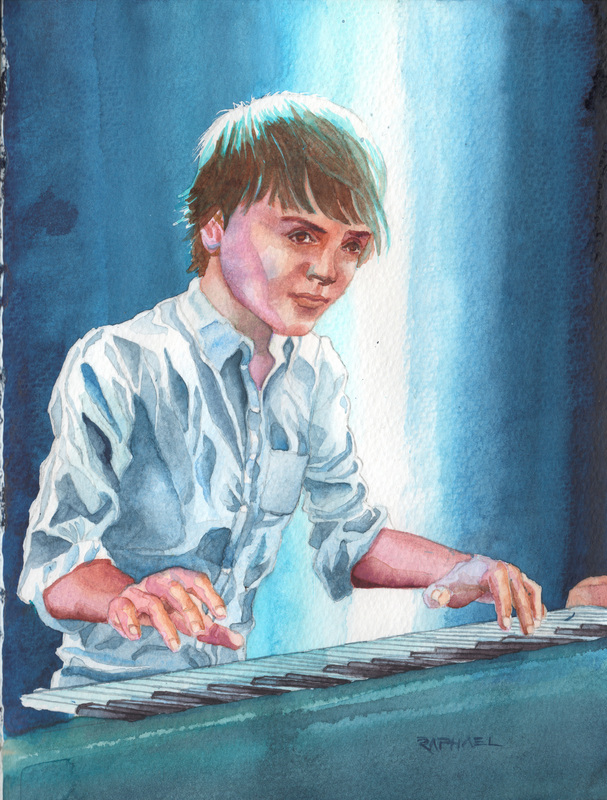 Although Cole is not the main character in this novel, I felt like I had to paint him because his life touched me. Schmincke Horadam watercolours on Strathmore Art Book watercolour paper 300g. My first attempt on a more complex watercolour painting. I know it is far from being a masterpiece with probably an endless list of mistakes. But hey, you live, you learn! Besides? I had tons of fun doing this! Why? 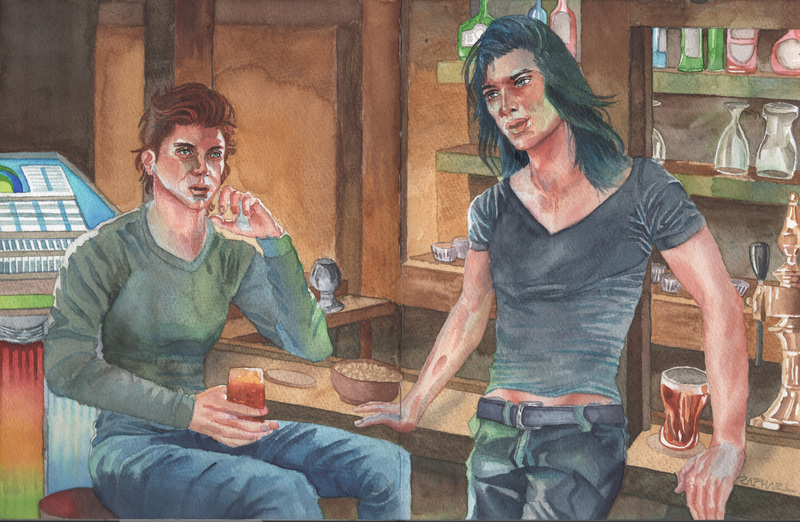 This painting depicts a scene from an unpublished story from my awesome buddy A.F. Henley: Fault Lines – Cheater. Fault Lines – Cheater is but one of a series of stories leading from one set of characters to another, all intertwined in fate and in the end they appear like a huge family. Rory, Danny, Connor, Scott, Lee, Blake, Dante, Aaron, Jeff, Gabe, Tristan, and Gavin – I loved you when I first read about you during a time when there where huge and beautiful changes in my own life. And I will always love you guys! Such great fun to finally return to colour these drawings! I will never get enough from these pick-up lines! The author and main character from A.F. Henley’s great novel The Chase and the Catch, that is supposed to write Parker Chase’s biography. That is the plan. Or is it? The man that John Liege was warned about by Parker’s own butler in A.F. Henley’s great novel The Chase and the Catch. Another first timer after a very long pause doing traditional art: pastels. In Henley’s thoughtful and captivating novel ”Forty-two Stairs“, Owen, who achieved a lot in his young life lost everything due to his serious problems with alcohol. Switching from his own house to a worn down apartment, he meets Sebastian, a young man suffering from anxiety attacks. It is this beauty and tenderness of their love that made me feel that pastels where the perfect medium to portrait a very intimate moment between these two very likable characters. 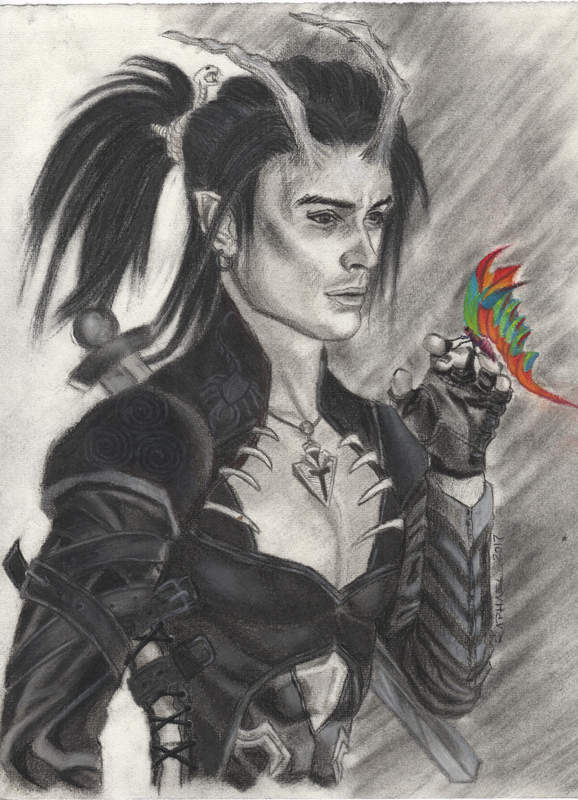 I took a photo of the drawing as it was too large to fit my scanner here. 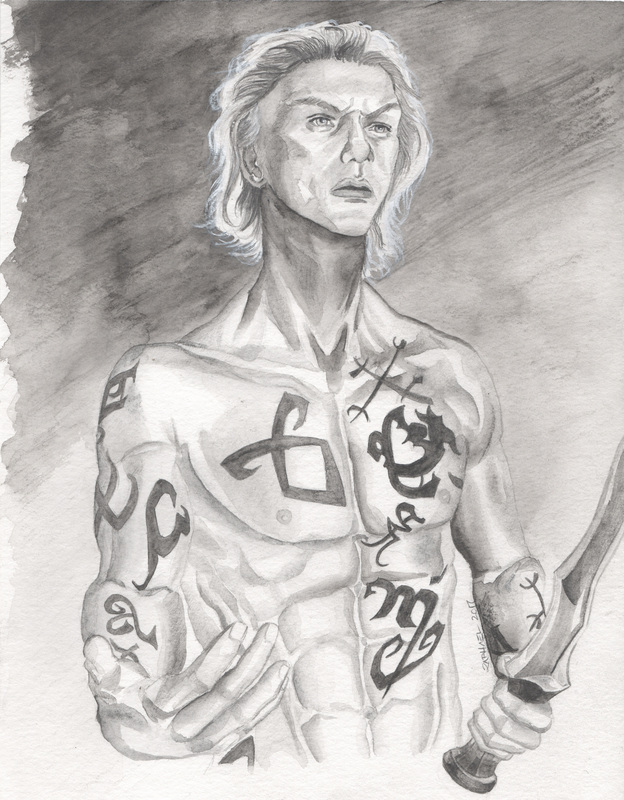 from the movie “Mortal Instruments”. I wanted to familiarise myself with watercolours again so I used the sketch done earlier. To be more precise, I drew this piece with water soluble pencils and then used brushes and water to get the watercolour effect. Done on Hahnemühle Cornwall watercolour paper. 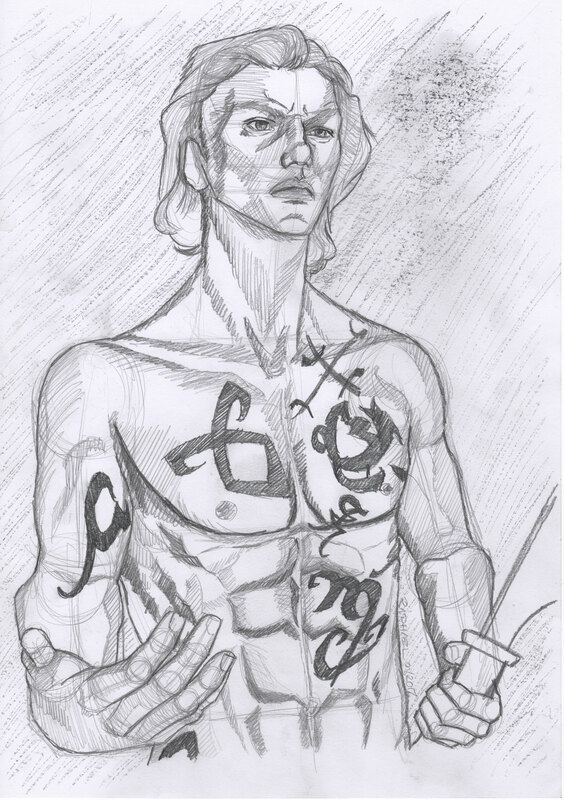 Rough sketch of Jamie Campbell Bower’s character Jace Wayland from the movie ”The Mortal Instruments“. 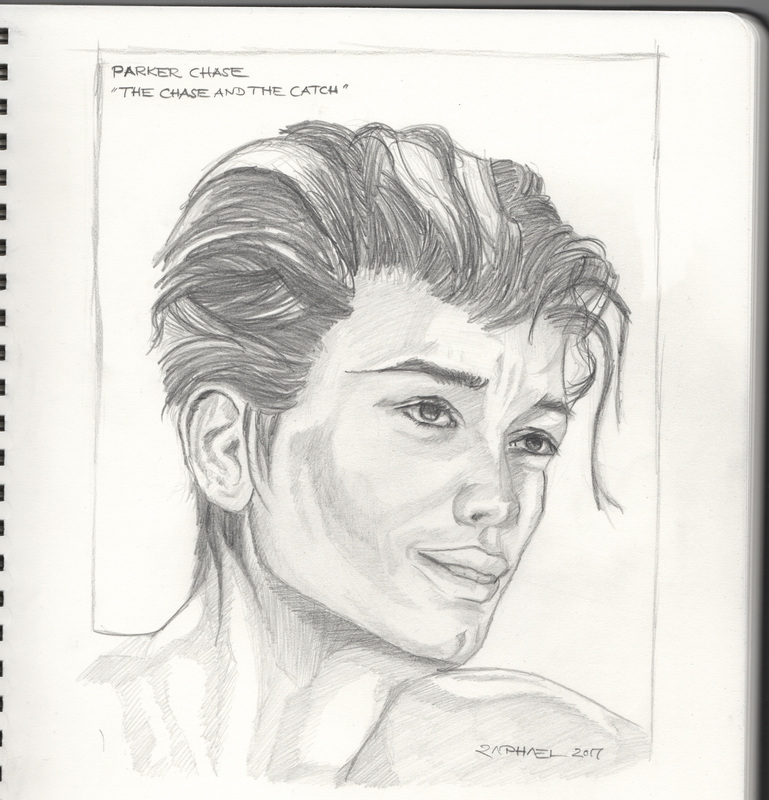 I made this sketch in an attempt to capture Jamie Bower’s features. This is my first piece and it may take some time finding my legs again. I almost forgot what huge fun it is to really get your fingers dirty while feeling a real pen touching real paper. It brings an intimacy between an artist and his work that digital art can not fully provide. Wow! You’re an incredibly talented artist! Thank you for sharing your art with the rest of the world,. This post just showed up for me under another art blog I follow. 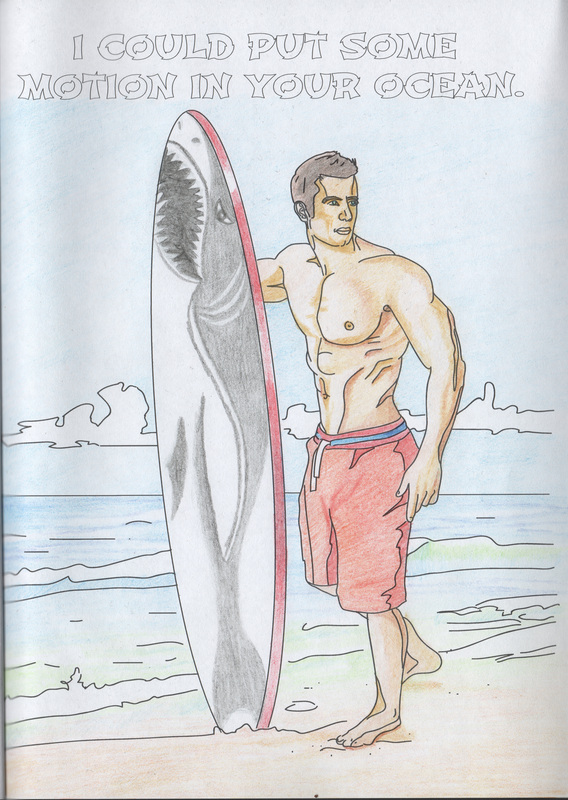 I love that one “Rory meets Danny” — the two guys at the bar — wonderful colours, layout, details, everything! Yes you are very talented! Keep going!